Six times a year APA's Planning Advisory Service publishes PAS Memo, an online newsletter covering a wide range of topics relevant to planning practitioners. Conservation limited development preserves a large portion of a tract of land for conservation while allowing limited development on some portion of that land. 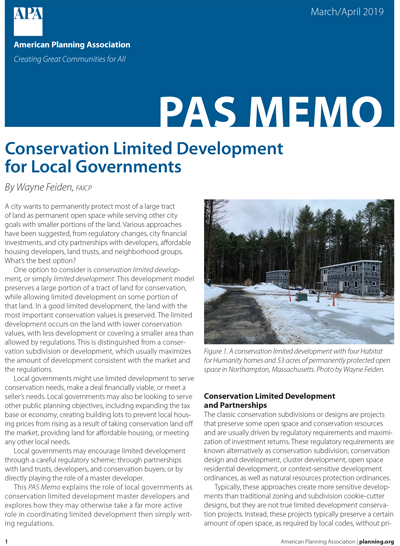 This PAS Memo examines how local governments can use conservation limited development as a tool to achieve multiple community goals. PAS Memo delivers. It's the best shop talk around, written by practicing planners and experts in the field eager to share their experiences. Each issue has illuminating case studies with links to online resources for planners who want to dig deeper. APA Members and PAS subscribers have access to all issues. Feedback on PAS Memo is welcome. Comment on the issues or suggest topics for upcoming editions. Are you a planner or authority in your field with expertise you'd like to share?